Sierra Aikido has a friendly, supportive and enjoyable training environment that welcomes people of all ages and physical abilities. Two highly experienced, senior instructors team teach each class to facilitate both group and individual learning. Most practice is in pairs, with senior students ( senpai ) helping newer students ( kohai ) as needed. Assisting newer students is a key aspect of learning for senior students, and provides opportunities to learn the fundamental movements with deeper understanding, gain a keen sense of a partner's motion, and teach with one's own clear movements rather than just words. Typically each session covers 2 or 3 throws. We introduce basic throws, review them in depth, and add new throws appropriate to each student's skill level. At each session students also practice basic footwork, the building blocks of Aikido throws and falls, as well as ukemi. Ukemi implies to attack on balance, follow a throw with agility, and take smooth falls. Individual instruction and self-paced training enables each student to develop at his or her own rate. The instructors work one-on-one with each member on correct throw forms, smooth falls, posture, body alignment, throwing stance, and the ability to adjust to a partner's movements. Testing or ranking (optional) is also self-paced. Each student tests when ready, and the instructors and more experienced students help with preparation for each test milestone. There is a structured, documented curriculum available to all, with clear training objectives for the group, as well as individual training objectives tailored to each member's personal requirements. The instructors regularly consult with all students on their progress. 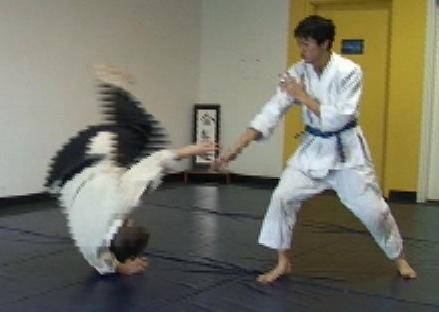 Emphasis is on quality and clarity of movement within the context of traditional Aikido throws and falls, rather than memorizing many complex techniques and forms. Basic, effective movements are more useful than a large repertoire of complex techniques as responses for every possible situation. The ultimate objective of Aikido is to transcend the techniques ( and fighting ) and to train our bodies' muscle memory to move intuitively and effectively. Members of all ages further benefit from a continually evolving, proprietary, online instructional library of both visual examples ( video clips and stills ) and printed information resources. The virtual library comprises Aikido techniques, footwork, test and rank requirements, individual and paired weapons ( bokken, jo, tanto ) techniques and exercises, etc. Sierra instructors are committed to working one-on-one with students to track their individual progress toward course objectives and meet personal needs and goals. The instructors regularly meet to review students' progress and the effectiveness of our teaching approach, as well as to coordinate the entire program. Everyone can do Aikido well with consistent support.